Microsoft is synonymous with the ubiquitous Windows operating system. But its Microsoft Office productivity suite pulls in more revenue than&#160;any version of Windows. Competition from Web-hosted productivity applications like Google Docs and Zoho Office has changed the rules of the application-suite game, however, threatening Microsoft's desktop application revenues and forcing it to address the growing popularity of Web-hosted applications with new features and products. 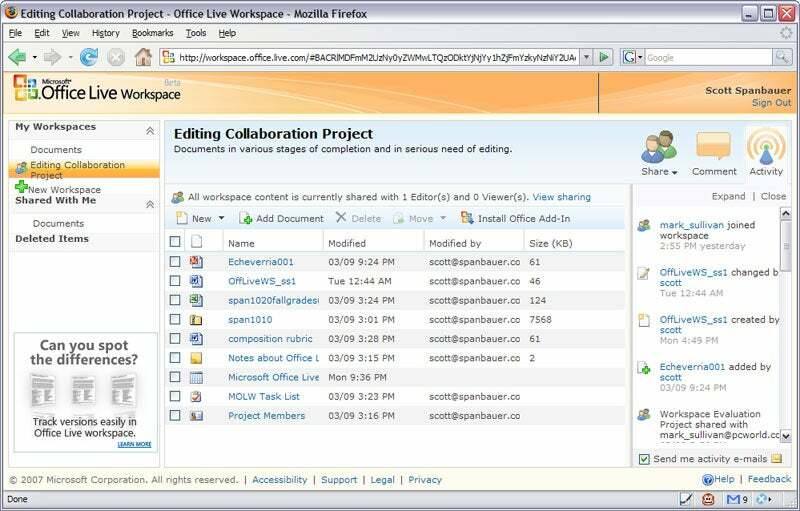 Office Live Workspace provides a full listing of hosted files, as well as a running log of all editing and sharing activities. The obvious move would be to offer free, ad-supported, feature-limited online versions of Office's flagship applications designed to compete head-on with Google's and Zoho's word-processing, spreadsheet, and presentation programs. Microsoft's free Office Live Workspace, however,&#160;takes a different tack&#160;by providing private and public shared online file areas, or workspaces, that are tightly linked to Office's desktop applications via a downloadable plug-in. Though it lacks advanced workflow, communications, and project management features, Office Live Workspace has more in common with collaborative Web services like Basecamp&#160;and Central Desktop&#160;than it does with Google's or Zoho's online suites. Currently ad-free, Microsoft says the site may eventually include advertising. Save Word and other Office files to the Web and share them with collaborators using Office Live Workspace's downloadable plug-in. Office Live Workspace anticipates the kinds of jobs you're likely to collaborate on, providing prefab workspace templates geared to specific business, school, and home tasks such as organizing a group meeting, launching a product, writing a term paper, throwing a party, or managing a little-league team. Individual templates contain document templates designed for the task, such as a project proposal outline in Word or a presentation in PowerPoint. Office Live Workspace supports Excel files, too, though none of the templates available when we reviewed the site were Excel files. On the other hand, the service doesn't support Microsoft's Access database format, which is too bad--Access users looking to delegate data entry and to simplify reporting tasks might benefit greatly from an online database-sharing arrangement. 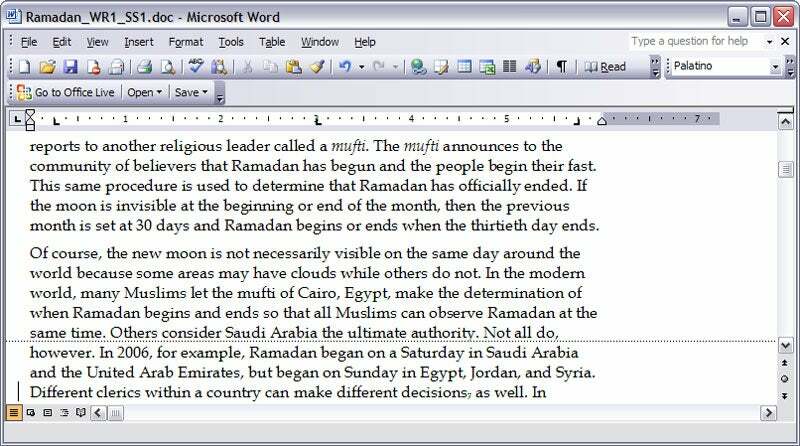 You can view documents in&#160;the three supported Office file types online, but to edit the files, you must download and open them in your local copy of Word, Excel, or PowerPoint, or in a compatible suite such as OpenOffice.org, and then reupload them when you're done editing. Emulating a handy feature pioneered by Zoho Office, the service also lets you open, edit, and save files directly from your Microsoft Office 2003 or 2007 applications to your online folders, using a downloadable toolbar plug-in. Besides working in the&#160;supported Office file types, you can create, view, and edit several other types of files--Events, Contacts, Task Lists, and Notes--via the Web interface, and sync these with the corresponding information types stored in your local copy of Microsoft Outlook. The site lets you create one other file type--a spreadsheet-like list--and export it to Excel format if you wish. You can upload other file types, too. The site simply displays an error message if you try to view or edit unsupported file formats. Invite others to view or edit individual files or the contents of entire Office Live Workspaces by e-mail. If you work with only a few collaborators, Office Live Workspace provides just the right combination of file-sharing controls and ease of use. 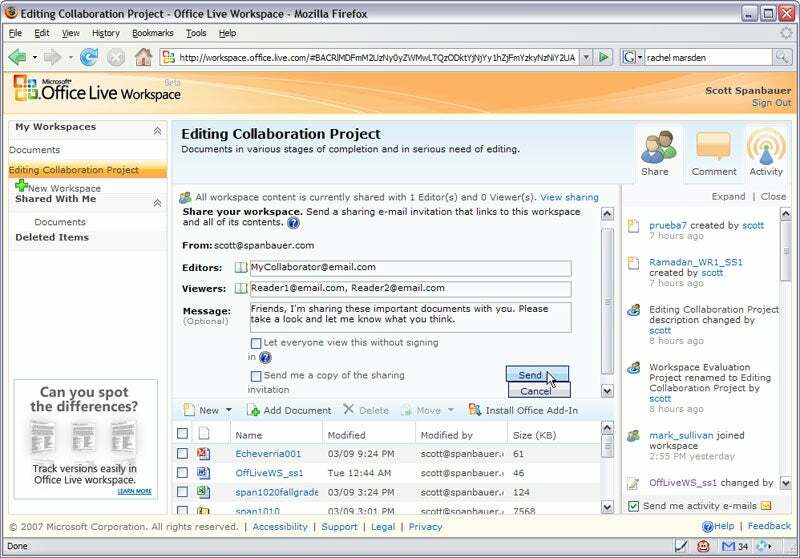 As the workspace administrator, you create a new shared workspace and then invite other users by e-mail to join it, either as viewers (who can see but not modify files) or as editors (who can see, create, and modify files). You can share workspaces with invited users, make them public, or keep them private. Files are easy to move from one workspace to another. Though&#160;you can't share individual workspace files, you can share individual files that are stored in the default 'Documents' folder. Office Live Workspace displays a log of file creation, editing, and deletion activity, and the administrator can retrieve an earlier version of a file if an editing snafu occurs.&#160;If you&#160;add the SharedView utility, a small download that's still in beta, you can share your screen and its applications with other workspace users--a feature that several other collaboration services offer as well. Only one user at a time&#160;can control and edit&#160;a document&#160;via&#160;SharedView, however.&#160;If you need tighter controls over file access, or other workflow tools like e-mail reminders of project milestones and due dates, choose a more powerful collaboration service. You'll also want to look elsewhere if your projects involve lots of large files. While other online storage services--including Google, Zoho, and Microsoft's own Windows Live Spaces--offer gigabytes of free storage, Office Live Workspace gives you just 500MB, with individual file size limited to 25MB. But if you and a few of your coworkers or family members want to collaborate in a lightweight fashion using Microsoft Office apps, Microsoft's unique response to Web-hosted applications could be a free and easy no-brainer.